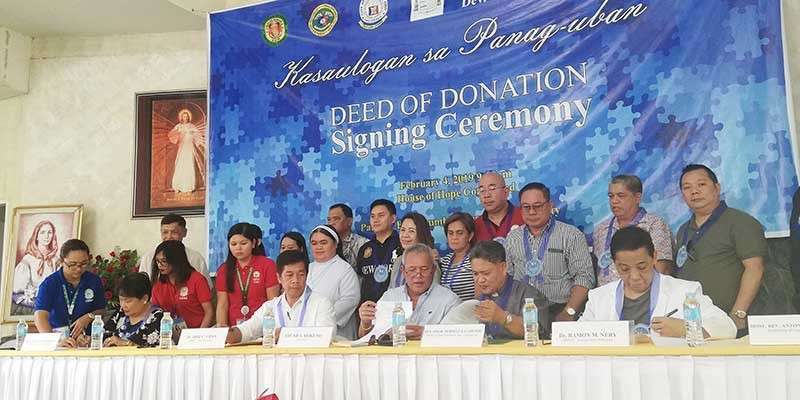 THE Cagayan de Oro City Government has signed on Monday, February 4, the deed of donation of the 1.5 hectare lot at the House of Hope, marking the change of ownership of the charitable institution from under the church to the local government unit. Mayor Oscar Moreno, however, clarified that the Archdiocese of Cagayan de Oro will not be stripped of its role in managing the institution for the mentally-challenged persons, but they will remain under the management of the church. Moreno said the city's takeover meant to improve and add more infrastructure projects of the 21-year-old facility in Upper Palalan, barangay Lumbia. The 1.5 hectare lot is donated by the Escaño family. Msgr. Perseus Cabunoc, chair of the House of Hope Inc. said they are eager to take part in this "radical shift" and continue its ministry to help the less fortunate. Cabunoc called the collaboration of the church and the government a historic one and will guarantee a bright future for the facility. The House of Hope currently houses 54 patients, but it can accommodate a maximum of 65 clients. Mayor Moreno for his part said, this move is in response to the Mental Health Act which was just signed last year. "Nothing will be more gigantic, meaningful than this because this is for mental health, and it is really an issue that should be attended to. In spite of the limitation we have to look under, we have to look for ways because after all, this is the task of the government," he said. Moreno also hoped that the Department of Health will be aggressive in putting up more projects in the facility, now that it's under the city government. The city, meanwhile, plans to put a building in the property for its expansion this year. The City Council has earlier approved to allocate P1 million for the House of Hope every year for medical supplies and other needs of the clients. The House of Hope, for its part, shall oversee the operation of the facility and will also accept help from the City Social Welfare and Development Office.